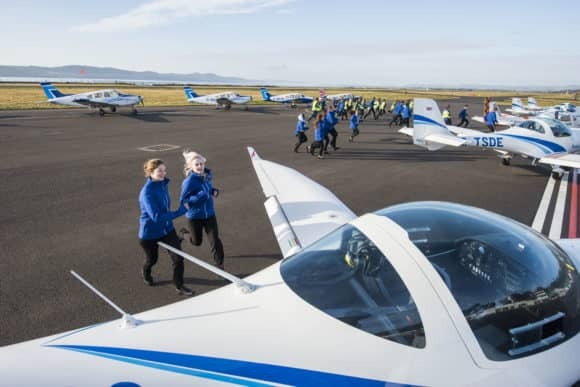 Scotland’s premier flight school is celebrating its 50th anniversary this week. Having flown 33 million miles since its launch in 1968, the equivalent of 70 trips to the moon and back, Tayside Aviation in Dundee marked its 50 years in business today (Thursday 22 February 2018) by conducting 50 training flights in just one hour! The multi award-winning business has trained over 5,000 commercial airline pilots in this time, 6,000 RAF cadets and flown a staggering 1,500 flying scholarships, including 300 from as far away as Hong Kong. In addition, the company, which employs 35 staff, ploughs around £1.5 million into the local economy each year, with trainee pilots from over 12 countries coming to Dundee – and to Fife Airport – to realise their aviation dreams. Tayside Aviation trains commercial pilots for airlines across the world, particularly for Loganair, who the company has had a long and successful partnership with, and FlyBe. At the heart of the company is the new BSc (Hons) Professional Aviation Pilot Practice degree, the first of its kind available in Scotland, in conjunction with Middlesex University and Aviation Skills Partnership. Launched in 2015, the degree greatly increases and accelerates students’ chances of gaining employment as airline pilots in what is a highly competitive industry. The degree aims to enhance students’ career progression and hopefully attract more females into the career who currently represent less than 10% of the UK’s commercial pilot cohort. Earlier this year, Tayside Aviation also launched an Initial Flight Training (IFT) course, which fast-tracks students onto the Honours pilot degree. 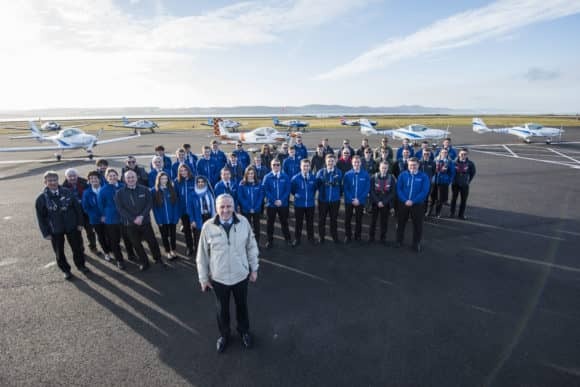 Jim Watt, Tayside Aviation’s Managing Director said, “We are delighted to have reached our 50th year in business and with 50 students under training . Last year, we were awarded the RAF Central Flying School Trophy for delivering excellence in flight training which was a fantastic endorsement, also recognising 30 years of serving the RAF. We are also excited about the year ahead with plans to create a pilot training academy. With the award of the first national 520 cadets a year contact in 1994, seven sub contracted flying schools throughout the country were appointed by the company to share the training. The company also provided aircraft on 24 hour standby to transport human organs (initially kidneys but latterly hearts) around the UK for transplants and over 50 such life-saving flights were made, including one to Norway. In 1975, former Lightning and Red Arrows pilot Ted Girdler was recruited as Operations Director and Chief Flying Instructor. In 1977, the company was granted a CAA Air Operators Certificate (AOC) and provided an air taxi charter service using a six seat Piper Aztec. The company has been involved in light aircraft maintenance since the engineering hangar was built by the Scottish Development Agency in 1982. 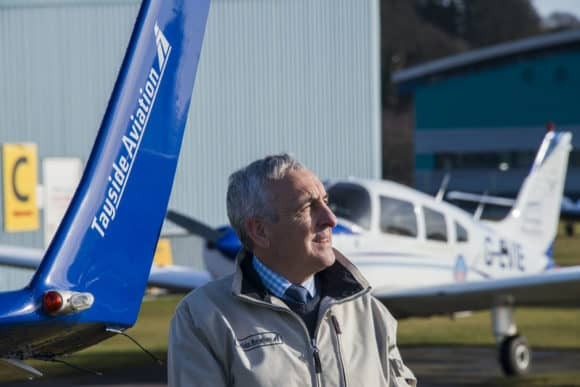 Tayside Aviation purchased the Aberdeen Flying Club and operated from Aberdeen Airport for five years. In 1990 the company was awarded a prestigious contract to provide flying training for cadets of the then Royal Hong Kong Auxiliary Air Force (now the Government Flying Service) and several of these were trained to multi engine and Instrument Rating standard in Dundee. Countless young men and women have been trained by Tayside Aviation and many have gone on to be military pilots or commercial airline pilots – eg Loganair take around 17 flying instructors each year from TA to be first officers, and the Air Vice Marshal in charge of the RAF Training Group completed a Flying Scholarship at Dundee. The company operates a fleet of 18 single and twin engine aircraft between Dundee and Fife (Glenrothes) Airports. Tayside Aviation received the Royal Air Force Central Flying School Trophy ‘in recognition of significant and outstanding contribution to excellence in the delivery of flying training and instructional standards’.